Mang Inasal, the country’s leading Pinoy BBQ quick service restaurant, is a blockbuster hit in many ways. After only 15 years, it was able to grow its number of stores to 500. The key driver to this phenomenal growth is its star-studded menu topbilled by its best-selling Chicken Inasal. So what's the secret behind its Chicken Inasal? Get to know why the country’s No.1 Chicken Inasal is the bomb whether you eat from the stick, off the stick or with your bare hands. 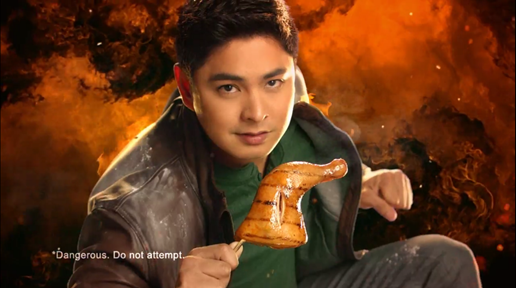 Mang Inasal's chicken meat chosen for your favorite grilled chicken is of top caliber – guaranteed to be of high quality to satisfy your action-star appetite and give the energy you need for that next action-packed moves. Last but not the least, with Mang Inasal Chicken Inasal’s exciting taste na malakas ang dating, mapapalaban ka sa sarap ng kainan. You will just keep coming back for more! Aside from the mouth-watering aroma and taste of each Chicken Inasal that only Mang Inasal can bring, it's best enjoyed with unlimited rice and chicken oil. Solved!